Having worked in the private sector before becoming a Linn County Supervisor, I understand how implementing the principles of business can improve the business of government. It is commonly asked, “why can’t government operate more like a business”? My answer to that is, in many ways, it can. 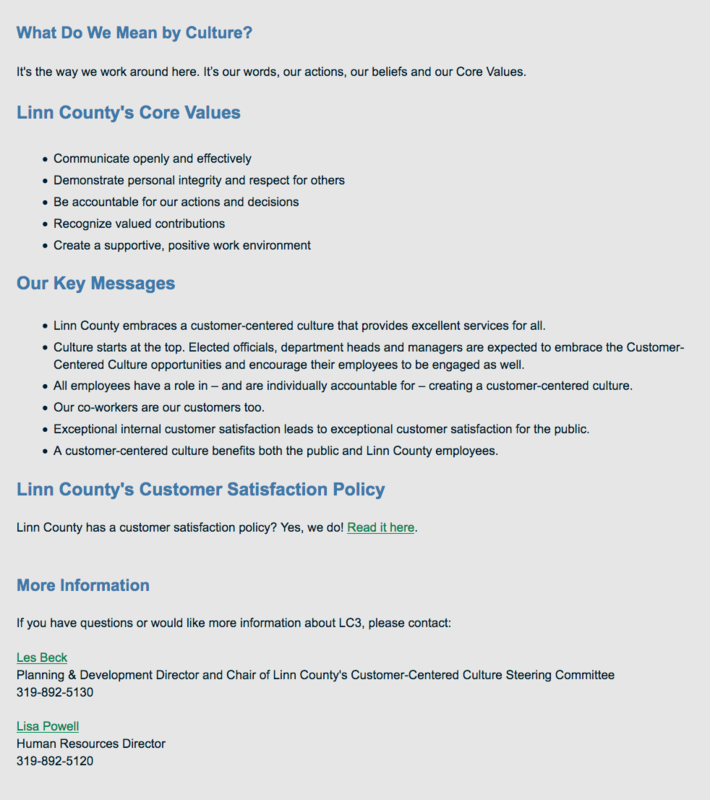 This is precisely what Linn County is doing. As part of our transformation, we are approaching our work in terms of “products”. This is critical so we can measure our products’ effectiveness, improve each product to meet the needs of our customers and discontinue products that do not meet our customers’ needs and expectations. This shift in mind-set differentiates Linn County from many other government entities. 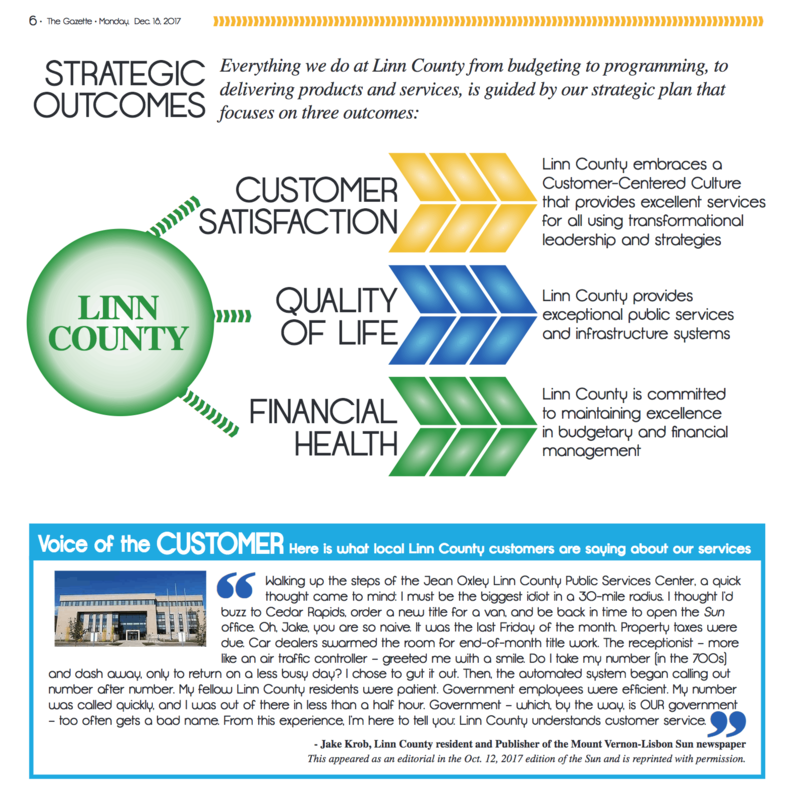 Linn County is guided by a new five-year strategic plan that focuses on three key areas: customer satisfaction, quality of life and maintaining our exceptional fiscal strength and stability. 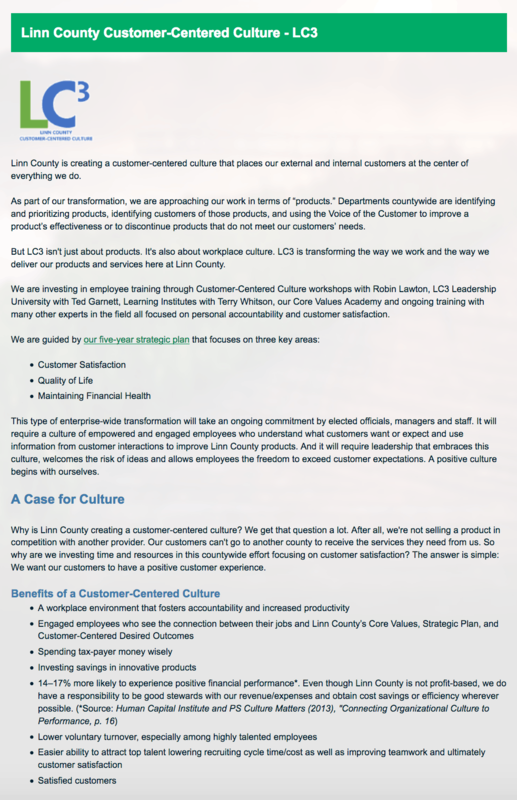 To accomplish these goals, Linn County has partnered with the Iowa Quality Center, renowned transformational consultant Rob Lawton, and local organizational expert Ted Garnett to help guide our organization toward continuous improvement and a customer-centered culture. We are implementing a wide variety of proven organizational transformation practices and business principles such as LEAN, Six Sigma, Kaizan and others, to improve the products we produce and the services we provide. Our bottom line is saving tax dollars through continual improvement. 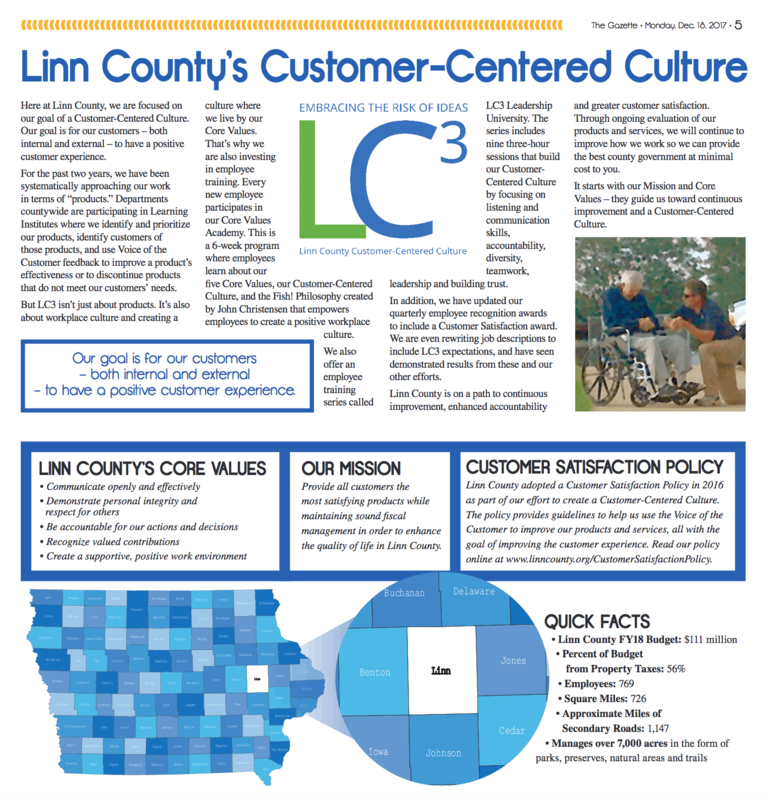 From front line employees to managers and elected officials, we are putting ourselves in our customers’ shoes to better understand their experiences, and then using that understanding to improve and innovate Linn County products. Very few executives truly understand how immersive one must be to have a full understanding of customers and their priorities. Ben gets it! This clip illustrates the lengths some of our C3 customers will go to understand the customer experience. Ben Rogers, Chair of the Board of Supervisors, Linn County, IA asked the Sheriff to taze him to better understand the customer. Linn County is located in East Central Iowa. Originally home to the Sac, Fox and Winnebago tribes, this area’s first settlers arrived in 1836. In 1839, the area was named Linn County in recognition of Lewis Fields Linn, a Missouri senator and strong proponent of Western expansion and development. 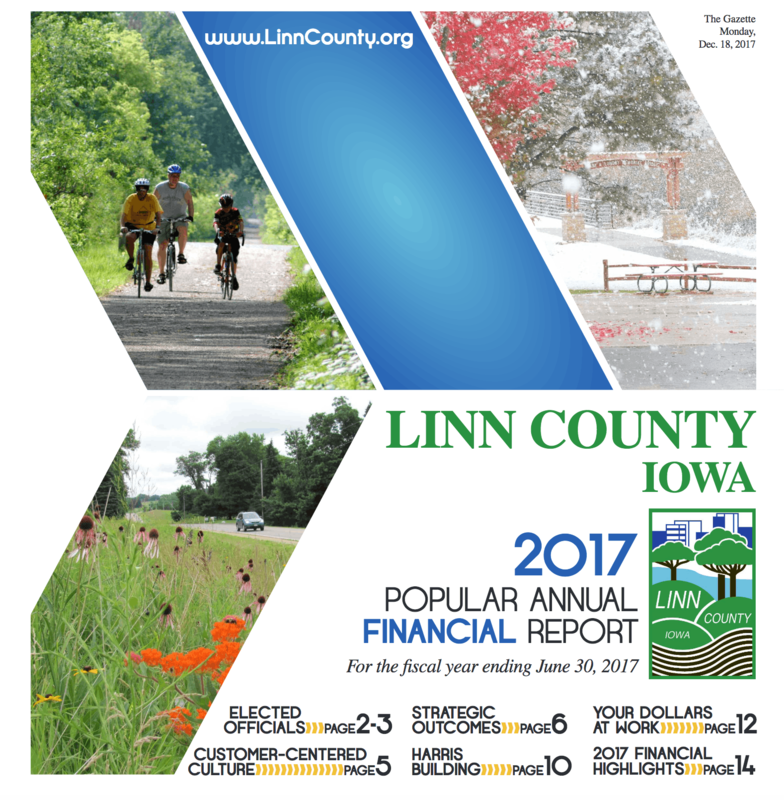 Linn County is the second most populous county in the state of Iowa. This report is referred to as a Popular Annual Financial Report (PAFR) by the Government Finance Officers Association (GFOA) because it is designed to give the populace an easy-to-read, less technical summary of county government and its financial condition. While the main purpose of this report is to provide financial information, it also highlights accomplishments and major initiatives of the past year, and demonstrates the vital role county government plays as a resource to all county residents and businesses. A vision to “simplify” its operations and processes to make life easier for its customers has guided the Missouri Department of Revenue since 1998. The department, which is responsible for the collection of taxes, titling and registration of motor vehicles, and the licensing of drivers throughout the state, has more interaction with the citizens of Missouri than any other state agency. In fiscal year 2000, approximately 4.3 million customers were served at the department’s 11 motor vehicle and driver licensing branch offices, 168 fee offices, 8 tax assistance centers and 12 field audit offices located throughout the state and over $11.2 billion in revenue was collected. Reduced income tax refund time by 80 percent, making Missouri the fastest in the nation. 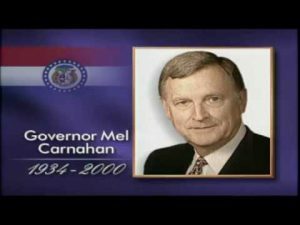 More than 550,000 Missourians filed their income tax return electronically in 2000, a 48 percent increase over 1999; Missouri ranks third in the nation in terms of the percentage of tax returns filed electronically. Reduced the wait lines in motor vehicle offices by over 50 percent, introducing new legislation that cut lifetime licensing costs to citizens in half. Moved 50 percent of tax filers off the 1040 long form to simpler, shorter, customized forms and filing options. Rescinded 107 tax rules and proposed 33 new rules to ensure simplicity and consistency. Redesigned the motor vehicle notice process, which resulted in over $2 million in savings for the department [with subsequent 2-year savings of over $20 million from just the first four C3 projects]. The leadership of the Department of Revenue is committed to achieving performance excellence and proving that state government can be run like the best business. Led by its Executive Leadership Team, the department has undergone a dramatic transformation. Their approach has been guided by the innovative Customer-Centered Culture (C3)® principles and methods developed by customer satisfaction expert Robin Lawton. Since 1998, the department has focused its efforts on defining its priorities, improving its products, changing attitudes and redesigning its structure – all with the intent to better meet customers’ needs. While the department’s vision to “simplify” has guided the department during the last three years, its values have served as the department’s conscience. Bottom Line: Focus on measurable results and create accountability for achieving them. Front Line: The department has over 2,000 employees dedicated to serving the citizens of Missouri and providing them with high levels of customer satisfaction. Front line employees have important insights into what customers want and how to make improvements. It is our job to engage their hearts and minds, support their growth and cultivate their ideas. Customer Line: Ask customers what they want and ensure that the lines of communication are open so they can tell us. Changing attitudes have also played a pivotal role in the department achieving its desired outcomes. To shift from enforcing compliance to voluntary compliance, the department developed a variety of strategies to encourage customers to comply with tax, motor vehicle and driver licensing laws. Some of the strategies implemented by the department include increasing public and business education on tax laws and rules, providing greater field and phone support to assist taxpayers, conducting educational courses for businesses, working with new businesses to help them set up their books to avoid errors and audits, opening the department’s auditor training manuals to the public and rewriting tax rules and regulations for simplicity, clarity and consistency. The Department of Revenue consists of three divisions: The Division of Administration, Division of Taxation and Collection, and the Division of Motor Vehicle and Drivers Licensing. The Division of Taxation and Collection was redesigned by tax type to increase accountability and innovation. Essentially, entire “businesses” were created to administer each different tax type. This structure ensures that for each tax, someone is accountable for the entire tax process from policy, to forms, to processing and account resolution. This structure also ensures that a taxpayer has one point of contact. In addition, it gives the department flexibility to shift staff within a tax unit as seasonal demands shift. The Division of Motor Vehicle and Drivers Licensing has also undergone a reorganization. Four bureaus were consolidated into three bureaus and functions were reorganized within the division to simplify its processes and to deliver products to customers in the most effective and expedient manner possible. Involving employees in all aspects of the department’s improvement efforts ensures that employees are supportive of the changes implemented at the department. Employees are involved in charter teams that are designed to tackle an operational issue and make recommendations on how the department can simplify its operations and improve customer service. Employee input is encouraged at the department through the IDEA (Improvements Designed to Eliminate Aggravation) program. In its first year, employees submitted over 1,500 IDEAS on how the department could improve customer satisfaction. IDEAS ranged from simplifying forms to redesigning processes to save time and money. Employees’ training needs are met through Rev’N U, a workforce and career development program. Rev’N U links educational programs and training opportunities to the department’s outcomes. The Leadership Development Program was also designed to improve the skills of its managers and the operations of the department. Listening to customers and responding to their needs, involving employees in the transformation and reorganization of the department, and focusing on results are at the core of the department’s improvement efforts that began in 1998 and continue today. While much progress has been made in simplifying the department’s operations, much work is still to be done. Winning the Missouri Quality Award, however, assures the department’s leadership that they are on the right path that leads to performance excellence. MnDOT’s WIG 2.0 teams have been challenged to look more closely, from a customer mindset, at the products they produce. 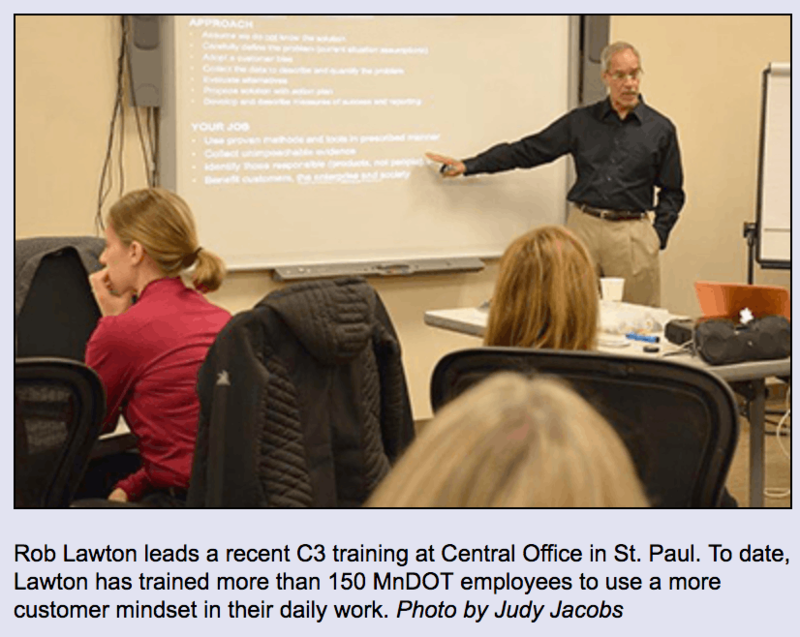 Since October 2016, more than 150 MnDOT senior leaders, WIG coaches and pilot project staff have attended training on how to use a customer viewpoint–versus a producer viewpoint–to help create a more customer-centered mindset. They learned that focus and experimentation on internal service products and processes create a good foundation for applying the philosophy and methods externally. Who are the end users of each of the products we deliver? What products do we produce? Do we know how customers think we are doing? How? 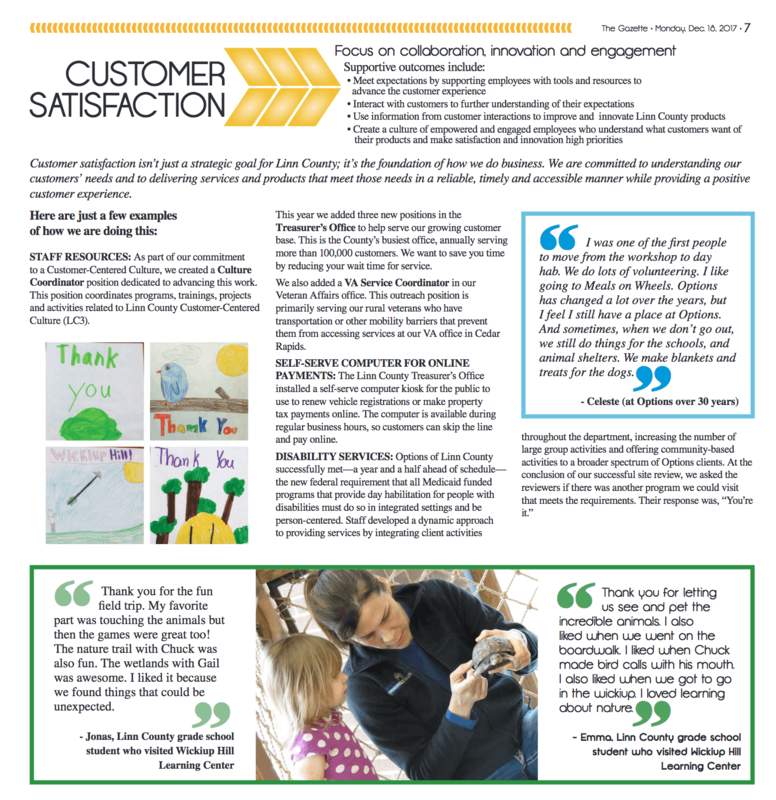 What can we do to delight our customers? Do we have an actionable, ongoing feedback loop with customers? How might we better measure and track customer satisfaction and improvements? The first phase of the project works to find out what the end users of a specific product want from that product and in what priority order. We are asked to focus on end user desired outcomes rather than on the process we use to create products. 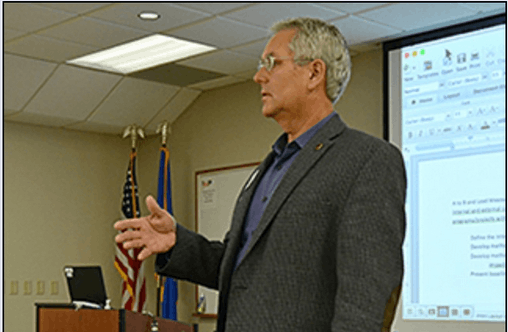 Participants were so interested in the approach that they have voluntarily decided to form pilot project teams over the last six months to incorporate the new concepts and make recommendations for improvement of targeted MnDOT products. The pilot projects are a way for MnDOT to learn and apply new tools that can help better identify what and how to measure performance metrics from a customer perspective. For the past year, Operations, Engineering Services and State Aid divisions have been collaborating to redesign the Locally Initiated Cooperative Agreement process to improve customer experiences and earn customer trust. A Locally Initiated Cooperative Agreement project begins when a city or county brings forward a project idea to MnDOT and the two agencies form a partnership around that project. WIG 2.0 and the five-year Strategic Operating Plan, has allowed the team to develop multiple recommendations based on product improvement and customer desired outcomes. 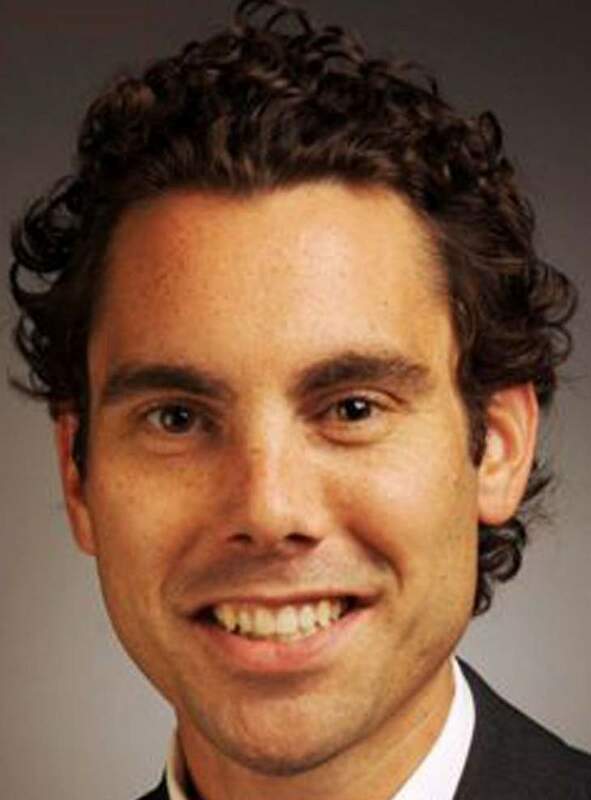 MnDOT can achieve a 75 percent reduction in processing time for Level 2 and 3 Locally Initiated Cooperative Agreement projects and reach a 68 percent reduction in time for Level 1 Cooperative agreements, he said. The project team spent many months analyzing current products and processes. They conducted statewide focus group workshops with 200 state, county, city and consultant participants. They also collected historical program and project data which validated customer experiences. The team then developed 24 recommendations to create a new process based on what customers said they wanted. These recommendations include shortening schedules, eliminating rework and redundancies, moving decision authority closer to the customers and instilling a customer mindset deeper into the organization. – Leadership will require everyone associated with this local program/projects to commit to time, cost and requirement reductions. – MnDOT will eliminate 60 percent plan requirements and geometric layouts for Level 2 and 3 projects with approval delegated from Central Office to the local district engineer. – For FY 18 and 19, $4.2 million will be programmed each year to deliver new projects. For FY 20, districts will contribute 5 percent of their trunk highway program. The recommendations brought forward from this WIG 2.0 team are deeply rooted in customer engagement, involvement, impact and experiences. One of the goals for MnDOT is to shift the organizational mindset from a producer-centered culture in which outcomes satisfy the agency to a customer-centered culture in which outcomes satisfy MnDOT’s internal and external customers. “We can implement many of these recommendations into our state-let programs as well,” said Chris Roy, assistant division director, Engineering Services Division. The Senior Leadership Team unanimously approved all recommendations at their Sept. 19 meeting and will begin implementation immediately. Additionally, the Resource Investment Council approved increased funding for the program during fiscal years 2018 and 2019. It’s a new concept, a different way of looking at things, with emphasis on what each and every employee can do to make things better. 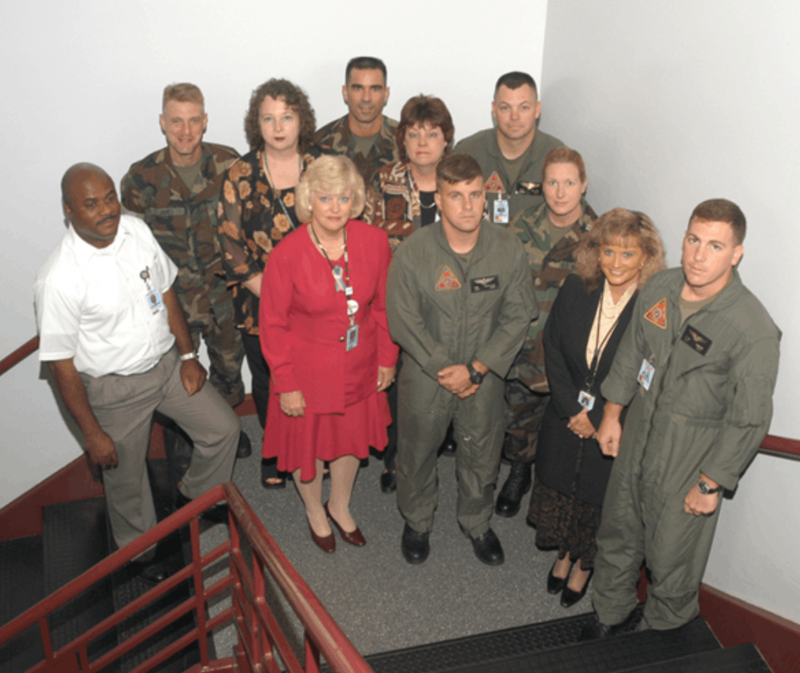 In its effort to create a customer-centered culture, the Naval Air Depot (NADEP) Cherry Point has adopted a proven, practical approach to achieving and sustaining leadership in quality and customer satisfaction. NADEP Cherry Point provides maintenance, engineering, and logistics support on a wide variety of aircraft, engines, and components for all branches of the U.S. armed forces. The depot’s mission is to support the Naval Air Systems Command (NAVAIR) in providing the American warfighter with absolute combat power through mastery of six broad categories of naval aviation technologies: sensors, aircraft, weapons, training, launch and recovery, and communications. Employing almost 4,000 people, the depot is the only source of repair within the continental United States for many jet and rotary wing engines. It is the Navy’s center of excellence for rotary wing aircraft, providing engineering and logistics support for all Navy helicopters. “Customer-Centered Culture (C3) is an attempt to get into the customer’s mind,” MaryEllen Kirkland, Supervisory Program Analyst, said. “It’s an efficient way to find out what the customer wants, needs, and expects and what we can do to provide it. 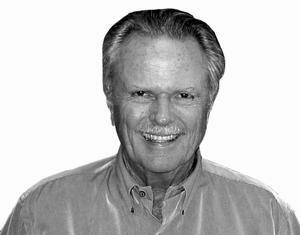 Pick Talley began his Florida water management career in 1971. He left in the ‘80’s to pursue a variety of endeavors including a stint as a County Commissioner and a golf course community development project with such luminaries as the Arnold Palmer Management Company. The attraction of public service and the satisfaction of community work brought him back to county water management in 1991. Pick was appointed in 1995 to Director of the new Pinellas County Utilities (PCU). 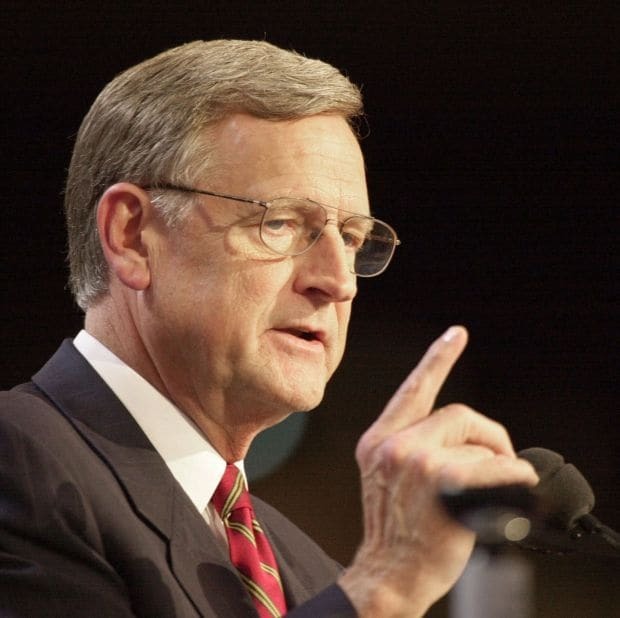 He was instrumental in creating this new agency by consolidating and restructuring three county government departments. The collaborative approach he used to do this has been a hallmark of his leadership style ever since. Pick has led PCU to notable success and national recognition in many areas. Dramatic population growth in the Florida county west of Tampa has put increasing demands on water supply. Under Pick’s guidance, PCU water consumption rates have dropped from 153 gallons per day per person in 1991 to only 93 gallons by 2005. This record of performance leads the nation. Another of Pick’s achievements is the transformation of “a stinking old sewer treatment facility” into an innovative park he calls a teaching reclamation plant – the South Cross Water Reclamation Facility. This is a beautiful place that clearly reflects the environmental sensitivity you might expect from a guy who loves to hunt, fish, golf, ski and boat. High school science classes include an educational tour of the plant as part of their curriculum. This backdrop of repeated success, coupled with his progressive and participative leadership style, enabled Pick to easily see how C3 principles could propel PCU even further. He championed the application of C3 in the development of PCU’s new strategic plan and balanced scorecard, beginning in the fall of 2003. He personally sponsored one of the first C3 projects, designed to simultaneously deploy the customer-centered strategic direction and demonstrate how to achieve high return on investment from the initiative. His legacy to the Pinellas County community will be a strong public utility where employees use customer-centered decision-making processes without any special effort. We treasure Pick’s friendship and salute him for modeling so well his vision of what is possible!